ICC is your full service one stop bathroom remodeling and renovation company. We specialize in all aspects of bathroom remodels and providing unbeatable customer service and unmatched experience along the way. 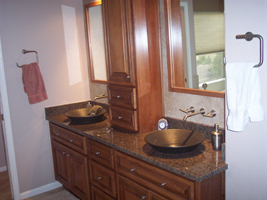 We believe that a bathroom remodel isn't completely done until the customer is 100% satisfied. Bathroom remodels can be a very complicated process for the home owner, at ICC we handle everything while keeping the customer informed every step of the way. Finding knowledgeable bathroom remodeling contractors in Arizona isn't easy as there are so many of them, that's why at ICC we pride ourselves in getting the job done correctly, on time and inside the original budget. Having knowledgeable and experienced contractors combined with top notch customer service is what separates ICC from other arizona general contractors. At ICC, we will let our work speak for itself. ICC has been trusted by numerous clients in Arizona to perform their bathroom remodels and have never received a complaint. We also realize that no one is perfect and if a mistake is made, we will stand behind our work and get it fixed. Stop worrying about whether or not the company that's performing your bathroom renovation is licensed bonded or insured. At ICC, we take all the proper steps to make sure that all job sites are clean, safe and protected against mistakes or accidents. As the customer, you can have a piece of mind that ICC will maintain a clean job site while taking all the necessary safety precautions. Check out our bathroom remodel portfolio and see for yourself why ICC is the only way to go when choosing a bathroom remodeling company in Arizona.